Philadelphia, PA – Chuck Taylor isn’t the only one who has identified an ally in this new “beef” between The Game and Meek Mill. While Drake recently made it quite clear that he’s still anti-Dreamchaser; pro “Back to Back,” Meek has taken to his hometown streets and returned with the war veteran Beanie Sigel, who apparently has gone half on a new diss track against their West Coast rival. “Please don’t bring me out of retirement!! 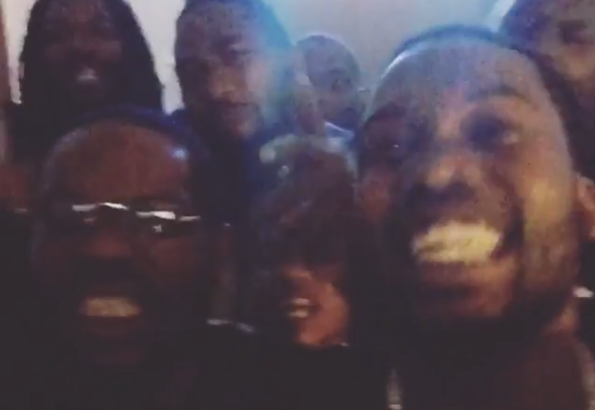 !,” Sigel captioned on a new Instagram video, as he was surrounded by Meek and several other members of both of their respective crews. Ironically the new diss track arrives just after a week Peedi Crakk hinted that State Property chimed in where it counted when it came time for Sigel to lyrically spar with Jadakiss in the early 00s. It’s a safe assumption to say the song is being mixed and mastered and could drop any second now. Fans always demand for conflicts to remain on wax and coupled with The Game’s uber disrespectful “92 Bars,” it looks like their prayers have been answered. Check out the preview of the “OOOUUU” freestyle diss down below. Please don't bring me out of retirement!!! Im putting them Fatigues back on for my city ! Straighten up or get straightened out ?